I LOVE this series! After that cliffhanger ending in Clockwork Prince, I'm DYING to get back into this story! And this cover has to be my favorite, by far. It's gorgeous! Soooo... What are you Waiting for this week??? Although I much prefer hot boys on the cover, I must say this one is absolutely stunnning!! Cannot wait for it either! Didn't really get into this series myself, but hear a lot about it! Oohh that girl is cocky!!! Lol she's like, "I know a secret, and you don't!" 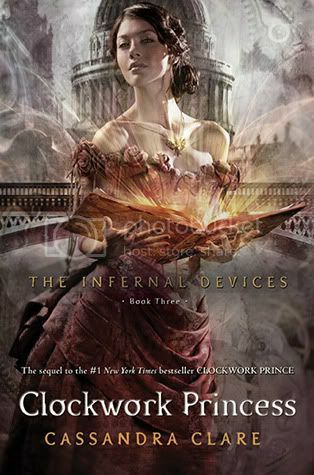 I still haven't read clockwork angel and I'm ashamed, it's even worse because i actually have it on my bookshelf right now... like, I'm looking at it... like, I'm poking it as i type (no i'm not) lol hopefully I'll get to it soon because literally EVERYONE loves this series! This is such a cool cover! I thought it was a bit cluttered when I first saw it but I really like it--plus, it matches the others. I love this cover! I agree, it's my favourite cover of the series too. I am very excited to read this too!